Responsible pet ownership includes monitoring the health of your pet on a regular basis, taking note of behavioral, eating or sleeping changes, and noticing symptoms that can signify the onset of health conditions. Chihuahua congestion, while common to the breed, is something that owners should pay close attention to. Chihuahuas are one of the most popular toy dog breeds in the world. They are known for their stubborn but loyal natures, their fearless attitudes and their devotion. Because of their small size and the shape of their heads and noses, Chihuahuas also are prone to upper respiratory problems, and the first sign of these problems is often congestion. Chihuahuas are prone to a condition known as reverse sneezing. Reverse sneezing is characterized by congestion, coughing, sneezing, and wheezing and is caused by an irritation of the soft pallet of the throat. Reverse sneezing is not harmful to dogs, and often goes away on its own. Allergies related to pollen, plant fibers, grains, rug fibers, cigarette smoke also cause congestion. 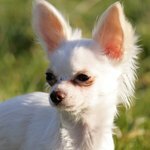 If your Chihuahua seems healthy and active otherwise, but is suffering from congestion, watery eyes, runny nose and sneezing, there is a strong possibility that it is suffering from allergies. Chihuahua congestion can also be a symptom of illness, especially when accompanied by lethargy, disorientation, vomiting and fever. Some Chihuahua owners keep their dogs indoors at all times neglect to have their pets vaccinated for kennel cough, or Bordetella. This disease is highly contagious and can rapidly lead to death if not treated in time. Chihuahua congestion should always be evaluated by a vet in order to identify its causes. Even if your Chihuahua does not appear to be sick, it is still a good idea to schedule a vet visit when you notice congestion, particularly if it is accompanied by other symptoms. Treatment for Chihuahua congestion depends on its cause. With reverse sneezing medical treatment is usually not necessary, but your veterinarian may show you how to help alleviate the episodes with a throat massage. Allergies may require an allergy medicine. If your Chihuahua shows symptoms of Bordetella, and has been recently exposed to many dogs in a confined area (like a shelter or a boarding kennel), treatment usually involves isolation from dogs and other pets and antibiotics. While Chihuahua congestion in and of itself is often no cause for alarm, it is always better to be safe then sorry when it comes to the health of your pet. Catching problems early is the best way to avoid complications in the long run.